Devonthink Pro Office — программное обеспечение для хранения, организации и поиска электронных документов в Mac OS X. Devonthink Pro Office в некотором роде можно назвать Вашим вторым мозгом, хранящим все цифровые файлы, будь то PDF-файлы, электронные письма, документы Word, или даже мультимедиа. Devonthink чрезвычайно гибок и легко настраивается под Ваши потребности. А если файлы не являются цифровыми, оцифруйте их при помощи Devonthink Pro Office. Используйте его как хранилище Ваших документов, файловый кабинет, почтовый архив, или как проектный органайзер – Devonthink может все это. Вы даже можете собирать и организовывать данные с веб-страниц для личного пользования, обогащать их звуковыми и видео файлами с вашего жесткого диска, а затем экспортировать готовый продукт в виде веб-сайта; или скопировать контент в Ваш iPod! Возможности ограничены только Вашим воображением. поддержка внешнего поискового API к базе. This release brings an exciting new improvement to sync: push notifications. When you make changes to your databases on Mac or mobile, a notification will be sent to other devices you are syncing. This decreases the amount of time before changes are downloaded. Also in this release, changing an encryption key for a sync location will prompt you what to do if you have already synced to it. Support for JSON RSS feeds has been added. Dragging and dropping text selections will include the reference URL of the file the text is dragged from. Some minor cosmetic adjustments have been made to the interface. And, as we always deliver, performance and stability has been improved. Added commands Set Title, Set Author, Set Subject, and Add Tag to the contextual menu of the preview when entering metadata after OCR has been performed. Added support for JSON RSS feeds. Push notifications are now used to notify synchronized devices of changes available for immediate download. For syncing with your iOS device, DEVONthink To Go 2.7 is required. On the Mac macOS Sierra is also required. Added an alert to clean the sync store after changing the encryption key on a sync location. Renamed Go > Workspace > Update to Update (…). The last used workspace is now updated. Preferences > General > Always open groups in a new window has been renamed to Double-click opens groups in a new window. Custom icons on formatted notes and web archives are retained after changes are saved. The URL field of imported and indexed files will now only use downloadable URLs, like web page addresses, imported from the files' metadata. When dragging or copying selections from plain or rich text documents, the reference URL of the record is included. Note: The use of the reference URL is up to the receiving application. Improved reliability when using Spotlight importers on macOS Mojave. 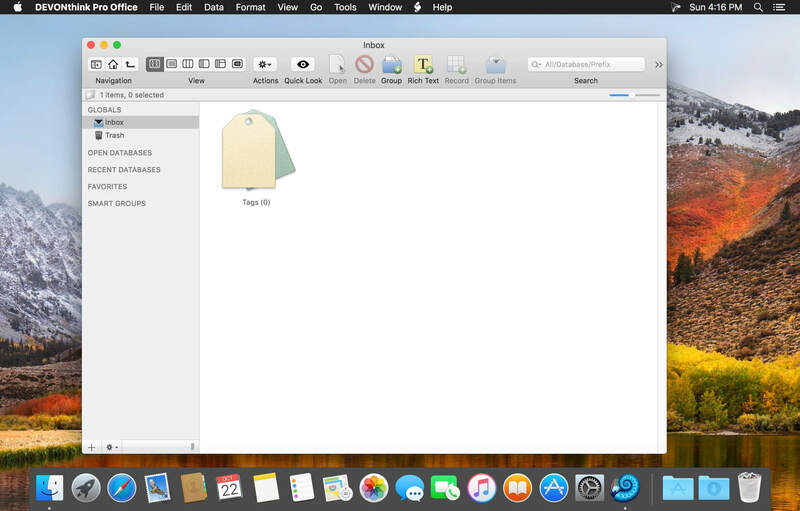 Improved naming of files when dragging pages from PDF sidebars to the Finder. 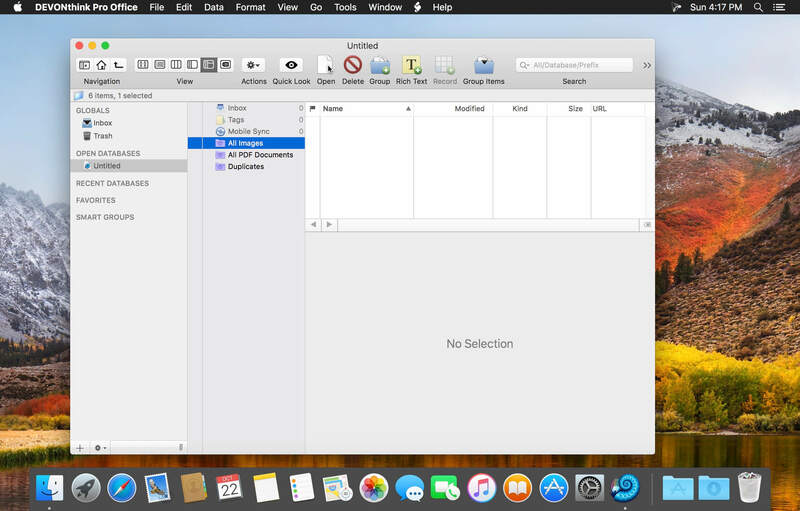 In addition, existing files aren't overwritten in the Finder anymore. Improved handling of RSS feeds with no title. Improved recognition whether an installed Mail plugin should be updated. Improved reliability, performance, and memory management of email archiving and indexing. The Support Assistant is now loaded from our website and uses styled, longer tips. Opening Preferences > Sync no longer immediately awakens external discs containing local sync stores. Setting the sync interval to Automatic now syncs more often. Improved handling of indexed files when synchronizing of indexed contents is disabled. Improved logging for troubleshooting purposes. Fixed an issue where an alert was not displayed after entering a license code for the wrong product or edition. Fixed an issue where dropping images into the preview pane could replace the currently displayed image. Fixed an issue where opening the License panel could stall the application when there is a slow or unreliable network connection. 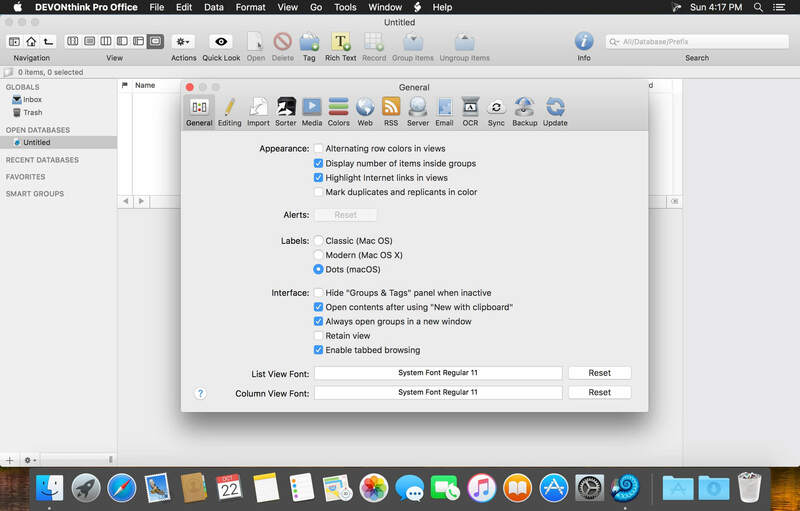 Fixed an issue where the background color of the left/upper pane of Split or Three Pane views wasn't always correct (macOS Mojave). Fixed an issue where the score of search results in the web interface wasn't always correct. Fixed an issue where the size of the preview of a PDF in the metadata panel wasn't correct after OCR is performed (macOS Mojave). Automatically Resize is now enabled by default. Fixed an issue where View > as Icons and View > as Split View could cause unnecessary console messages (macOS High Sierra and later). Fixed a rare crash caused by the Pantomime framework. Fixed an artifact in the list of databases in Preferences > Sync on macOS Mojave. Fixed an issue where cleaning sync stores could fail if an incorrect encryption key was entered. Fixed an issue where downloading indexed pending items could fail if the item was uploaded as an imported one and deconsolidated later if the Synchronize indexed contents sync location option was disabled on the Mac. This reduces also slightly the memory footprint and the delay before synchronizing, especially on iOS. Fixed an issue with syncing indexed file causing unnecessary download attempts. Fixed a rare crash that occurred while cleaning or verifying sync stores. Fixed an crash caused by corrupted sync status files.